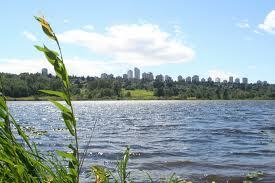 The sun is sparkling on the calm waters of Deer Lake as I set off from the parking lot along Burnaby’s Sperling Avenue. The lake is the centrepiece of the city’s unique 207-hectare Deer Lake Park and a walk around its 2.4-kilometre perimeter takes less than an hour. But Colleen Hale, a local volunteer who leads walks in the area and is my guide for the day, suggests we explore farther afield. “It smells like fruit in the late spring,” she tells me as we veer off the north shoreline to a trail. I later learn that the Coast Salish gathered wild cranberries here, and farmers established strawberry fields and orchards in the late 1800s. While in operation, nearby Oakalla Prison Farm produced vegetables, along with dairy and livestock. We pass the Townley Mansion; its all-white stucco exterior and “Colonial Revival style” harkens back to plantation life in the old American south. The house is one of a dozen city-owned heritage properties scattered around the lake. Visitors can wander the landscaped grounds and even step inside some of these former homes—including Ceperley Mansion, now the Burnaby Art Gallery, and Hart House, a finedining restaurant. Other trails lead to the Shadbolt Centre for the Arts and the Burnaby Village Museum, a replica of a 1920s village complete with carousel, blacksmith shop, and ice cream parlour. Eventually a sloping trail to the southwest takes us to higher ground along the park’s border. We reach the preserved concrete stairs of Oakalla prison, all that remains of the institution. Its meadows west of the lake were incorporated into the park and in 1991 the old brick Oakalla Prison Farm was torn down. We duly read the historic marker before continuing on. We come to the “312 Stairs,” as they are named, adjacent to the Royal Oakland Park residential neighbourhood. Small plaques on some steps tell Aboriginal stories, including the legend of an underground stream connecting Deer Lake to False Creek in Vancouver. The story reminds us of the sacred web of waters beneath our feet. A panoramic view of the mountains gives us a good reason for rest stops as we head down a trail back to Deer Lake. At the south shoreline, we peer through floor-to-ceiling windows of the Baldwin House, built in 1965 and designed by renowned architect Arthur Erickson. Set further back is another city-owned property, the Eagles Estate. A stack of rental boats catches my eye before we return to the parking lot. As we say our good-byes, I am already planning my next visit to this urban oasis— when I will eat strawberries and float in a canoe.